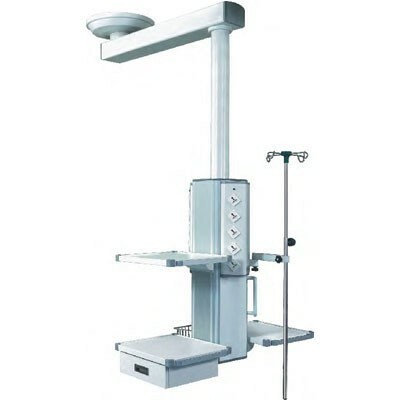 The Single Arm Medical Equipment Boom is an integrated system that provides all medical gas electrical services and facilitates equipment management easily. The Single Arm Surgical Pendant is made of a high strength aluminum alloy which enables it to support up to 440 lbs (200 kg). 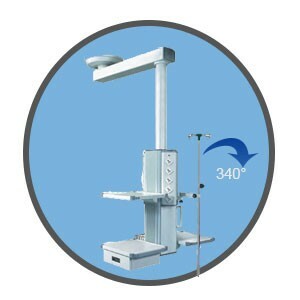 This medical equipment boom has a movement angle of 340 degrees and a single arm rotating radius of 900mm. Perfect for placing medical equipment such as medical video recorders, medical audio recorders, medical printers and more onto shelves. Configuration includes: 3 instrument shelves, 1L. V pole, 1 drawer, 10 electrical sockets, 1 basket (pneumatic brake is optional).